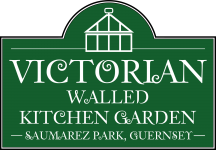 The walled garden has 5 annually rotating plots and a soft fruit bed separated by paths, as well as a cutting flower bed, a herb bed, an area for permanent vegetables and a plot for Oriental vegetables – this being a legacy crop to the time spent in Japan by the 4th Baron, James St. Vincent de Saumarez. The garden area has been planted with over three hundred different varieties of vegetables, fruit and flowers known to have been in use in the 1880’s. Plants with a Guernsey connection are also grown, such as Guernsey chives, Guernsey Demi-Longue parsnip and Lisbonais parsnips. Fruit trees: Upton Pyne, Ribston Pippin, Golden Reinette and Calville Blanche. Pears include: Chaumontel, Doyenné du Comice and Louise Bonne. There are Morello cherries and Portugal quinces. Our Victorian sweetpeas are sold at our garden shop each summer and remain a firm favourite with visitors and islanders.